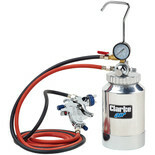 Gravity fed sprayguns remain a popular choice for auto refinishing and manufacturing trades. This precision model gives excellent atomisation and speed of application demanded by professionals. 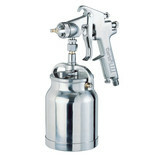 Gravity fed sprayguns remain a popular choice for auto refinishing and manufacturing trades. This precision model gives the excellent atomisation and speed of application demanded by professionals. 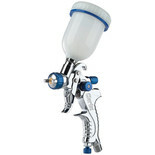 A top class spraygun for professionals producing results of the very highest quality. 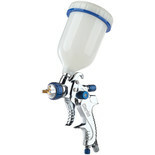 Superbly finished and precision engineered for perfect paint atomisation and distribution. 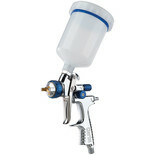 A top class spraygun for professionals, producing results of the very highest quality. 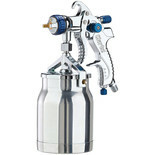 Superbly finished and precision engineered for perfect atomisation and distribution. 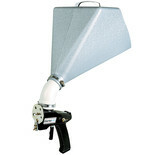 Ideal for the hire trade and professional builders & decorators, this high capacity unit is designed for large surface coverage and will handle most textured wall and ceiling finishes. 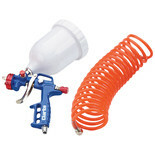 The Clarke KIT300B Gravity Fed Spray Gun is suitable for mostspray painting applications, with the 1/4" BSP fitting and 500ml container.